What happens when you combine the vegetarian ingredient of the ’90s with two of the healthy ingredients of the 21st century? When I was in high school, my vegetarian friends were often given one choice on the restaurant menu and it was always the same: The portobello mushroom burger. When I received a couple of the massive shrooms in my CSA box, I broiled them up. I have to say, I forgot how good they can be: umami-rich but still juicy and, dare I say it, kind of meaty. I ended up piling a quinoa pilaf-and-kale salad on top of them to make a satisfying vegan dish. If you prefer, you could swap out some of the quinoa for avocado or nuts. Or, if you don’t mind a little dairy, add some feta cheese. Vegan dishes can be hard to pair with red wine but mushrooms always help. A French Cabernet Franc is an excellent choice because it’s light enough to pair with the salad but meaty enough for the mushrooms. 1. In a medium pot, heat 1 tablespoon of the olive oil. Add the leek, season with salt and pepper and cook over moderately high heat until the slices start to brown, about 5 minutes. Add the quinoa and cook until is starts to smell toasty, about 1 minute. Add the stock or water and bring to a boil. Cover and simmer over moderately low heat for about 15 minutes, until most of the water has been absorbed. Turn off the heat and let the quinoa stand for 5 minutes. Fluff the quinoa with a fork. 2. Meanwhile, preheat the broiler to high. Scrape the dark brown gills out of the mushroom caps and arrange them on a baking sheet. Brush both sides with 1 tablespoon of the olive oil and season with salt and pepper. Squeeze half of the lemon over both sides of the mushrooms then broil for about 8 minutes, turning once halfway through, until tender. 3. In a medium bowl, combine the kale with a pinch of salt and the juice from the other half of lemon. Rub the salt into the leaves until they’re slightly wilted. Add the warm quinoa to the bowl and toss. 4. Transfer the broiled mushrooms to plates, top side down. 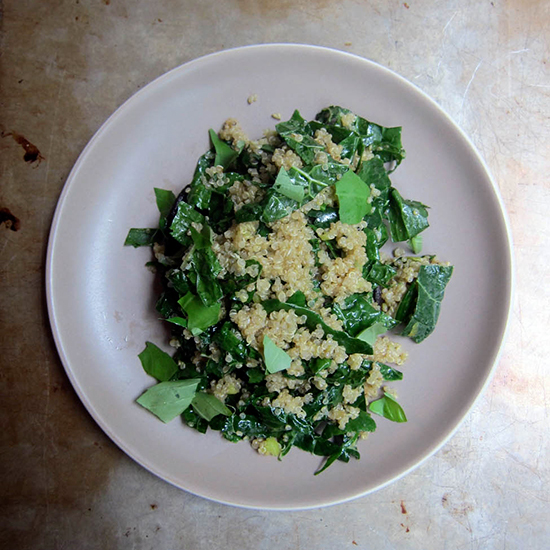 Pile the quinoa-kale salad on top, garnish with torn basil leaves and serve. One serving 463 cal, 19 gm fat, 2.3 gm sat fat, 64 gm carb, 6 gm fiber, 13 gm protein. Wine A cherry–rich Cabernet Franc from France’s Loire Valley, such as the 2012 Domaine des Roches Neuves Saumur Champigny.